A few months ago, Peter Oxland, a crisis line volunteer at Distress Centre Calgary, answered a call at 2:30am and heard a faint whisper on the other end of the line. “The young girl eventually shared that she had had Distress Centre’s telephone number for nine months and had finally got the courage to call,” Peter recalled. She shared that due to drug addiction, her life and her family’s life, had hit rock bottom. She was thinking of self-harming as a way to cope and to end her life. Over the next hour, Peter listened to her challenges, hearing her voice slowly grow louder as she gained trust in this man she had never met, and never would meet. At the end of the call, the girl thanked Peter, telling him that he was the only person she had ever told about her life and wanting to end it. She said she felt much better now. Peter thanked her for having the courage to call and welcomed her to call our crisis line again if she ever needed to. Peter began volunteering at Distress Centre in September 2016, after completing the volunteer training. His desire to become a crisis line volunteer stemmed from his own experiences with crisis and distress, and discovering his true passion. In 2012, Peter’s wife, Barb, died in Intensive Care at Foothills Medical Centre after the late discovery of a malignant tumour which had masqueraded as chronic sinusitis. Since then, Peter has volunteered with Alberta Health Services (AHS) Critical Care, the AHS Grief Support Program’s mature spousal loss support groups, and with Wellspring Calgary, hosting drum circles and kalimba workshops. Peter’s son took part in an addictions recovery program in B.C. in 2016, and Peter participated in the family program on many weekends while his son was there. It was a conversation with the family counsellor/volunteer coordinator from the Grief Support Program that led Peter to volunteering on our crisis lines. “While our personal experiences have clearly been challenging for all members of my family, my journey with intensive care, grief, cancer, and addictions and mental health have helped reinforce to me my passion – to serve those in distress,” Peter said. He says that Distress Centre’s vision, “Everyone is heard,” is one that is deeply meaningful to him. Peter discovered another avenue for supporting Distress Centre and the work we do. 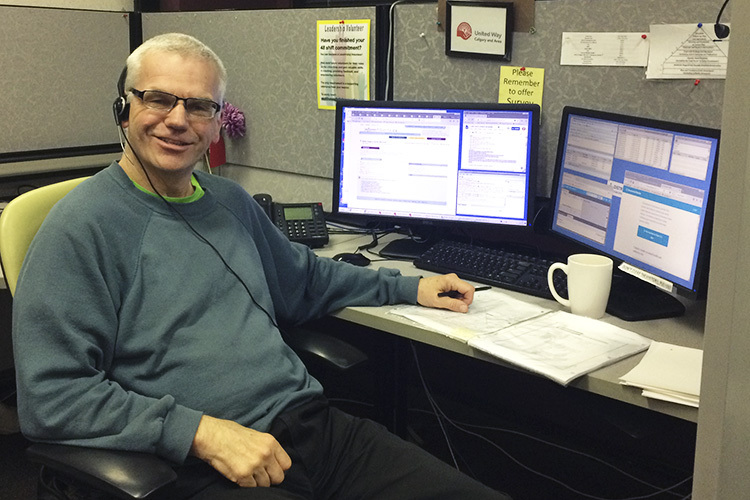 Peter worked at IBM Canada for over 33 years before retiring in 2013. His position when he retired was as a Senior Managing Consultant with the IT Strategy & Architecture arm of IBM Global Technology Services. He discovered that IBM has a grant program where they will provide funding to eligible community organizations and schools where IBM employees and retirees are actively volunteering. He applied for the grant in 2017 and was successful, resulting in a grant of $2,000 for Distress Centre! This money will help support our crisis services. He encourages anyone who volunteers to see if their work offers a similar grant program to the one offered by IBM. With a relatively small amount of work, you can be the source of a substantial donation to an organization you’re invested in. Thank you Peter, for volunteering your time on our crisis lines and for taking the time to successfully pursue a grant from IBM. A huge thank you also goes out to IBM, for offering this grant program and supporting our crisis services. Related: Shane Stronach, a Nexen employee and crisis line volunteer also took advantage of his employer’s grant program. Read his story.